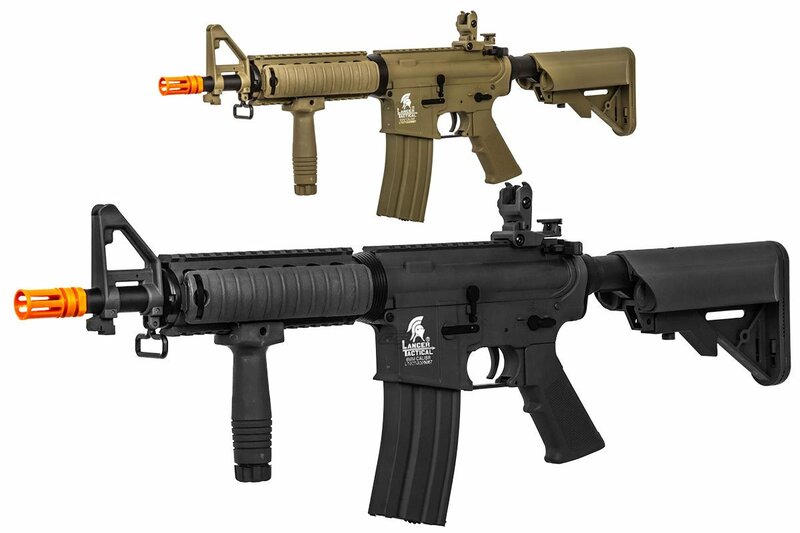 Drop into the airsoft warzone without dropping a lot of cash with the second generation of Lancer Tactical airsoft rifles. 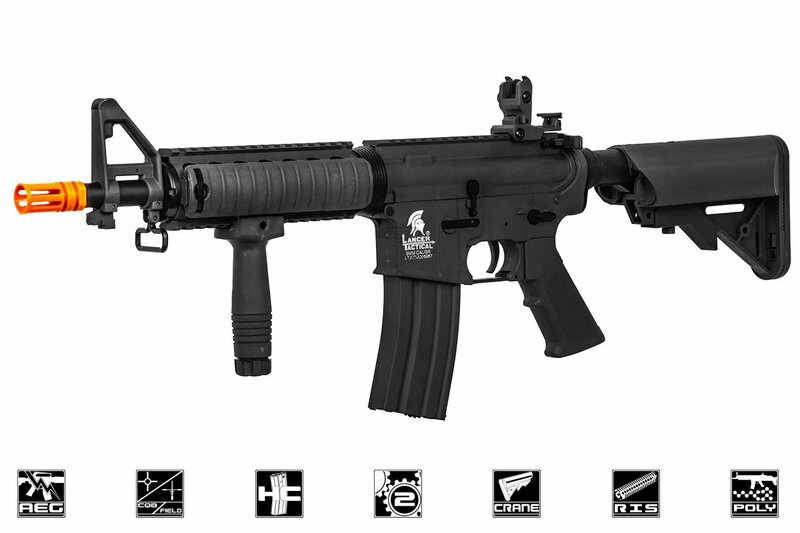 The Lancer Tactical Generation 2 MK18 MOD0 Carbine AEG from Airsoft GI features a new and upgraded nylon-reinforced polymer body. That puts a tough, durable and lightweight rifle in your hands. Not only will you survive; you can conquer and thrive with this highly portable and accurate carbine. The gun has an adjustable front and rear sight, so you can dial in and zero your shots, and a flip-up rear sight. Attaching an optic is easy, because you can flip the rear sight down when not in use. This carbine is a clone of a MK18 MOD0 and is available in your choice of black or tan. It utilizes a quad rail handguard, so you can customize the gun to the types of environments you play in and your exact needs. Install your favorite attachments, such as grips and rail covers (included with this gun), flashlights, PEQ boxes and more. One sling loop in the front and a QD point at the rear of the rifle allow you to attach a sling to make the rifle more comfortable to handle. Inside, the second generation of these Lancer Tactical weapons comes with standard Version 2 gearboxes. That means you will always be able to find plenty of upgrades and modifications to keep up with changes in your style of play and in the airsoft industry. These upgraded gearboxes boast an upgraded motor, 8mm ball bearings to ensure the gears spin more efficiently with less friction, a quick-change spring system and low-resistance wiring to ensure electrical flow from your battery to your rifle. The rifle also features a 6.03mm tight-bore barrel and a rotary dial hop-up unit to allow for more precise, accurate shots at range. This model shoots approximately 330 to 345 feet per second out of the box, making it CQB legal and perfect for those close-quarter engagements. This gun's fast rate of fire will keep your opponents hopping. These guns come with a high-cap mag, a foregrip and rail covers for extra comfort and maneuverability, a juicy 9.6V battery and a smart charger. The price for the entire package? Exceptionally low! Whether you are a beginner looking for an inexpensive entry point into a great game or a veteran on a budget, this package offers amazing value. So pick one up and enter the fight with this outstanding example of the bold new second generation of Lancer Tactical M4 carbines. I wanted to get into airsoft for cheap, just to start. I had someone tell me about this gun so I looked at it and decided to pull the trigger on it. Great gun for the price, especially because of all the things it comes with. This was a magnifacent first airsoft gun! It came on time, and it shoots very nice, and is very accurate! This is my first time ever buying a airsoft gun I would recommend this to anyone getting into airsoft! i just bought this gun and i hope it is not broken like my other gun that i got a few weeks back from airsoft megastore but anyhow this thing looks awesome and it comes with all the things you need to start playing with. Whatâ€™s the size of the inner barrel ? What type of motor does it have and is it long or short?? It uses standard Long type motors. The threads on this gun is 14mm negative CCW. The description says it includes a smart charger. So I was wondering if it was any good or not. I donâ€™t want to use a crappy smart charger. It will work with it's intended purpose. Is this gun tested with a 0.20g bb for 330-345fps? Unless stated otherwise, all chronograph tests are taken with 0.20g BBs. Will work with .20 or .12 BB? If I mount a red dot on the rails, will the front sight be in the way? If so how do I take that off? It will be "In the way" but if you use a red dot, the front sight can be a good reference point for aiming, should your dot be off zero. Is the gearbox for the gun metal or plastic?